Our annual all-comers track & field series is our pride and joy. We have been doing this for the general track & field community since 1969. Welcome to the Resolution Run 5K & optional Polar Bear Dive! 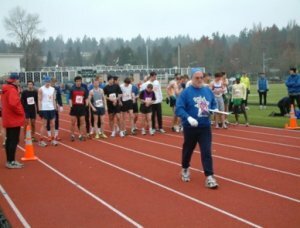 This annual 5K run/walk takes place at Magnuson Park in Seattle on January 1. Includes optional polar bear dive within 100 yards of the finish line. Each season features a series of six two-mile races that includes road running, cross country, and racing on the track. Join us for monthly events at beautiful Magnuson Park on the shores of Lake Washington. Rain or shine, we'll be here to help you meet your fitness goals and new friends at the same time. One of Seattle's iconic fall cross country meets located in Lower Woodland Park.